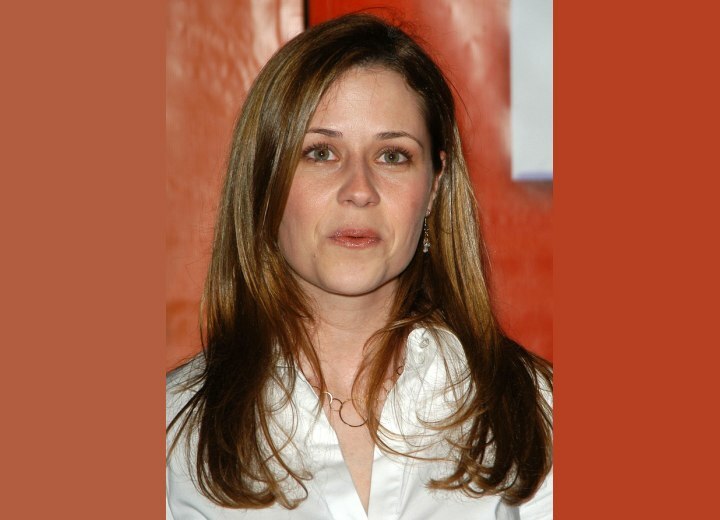 Jenna Fischer keeps a high side part in her long golden brown hair (January 21st, 2005). There are various hues of becoming darker browns and light blonde that encourage the warmth we see in her hair. Super long layers are detected with smooth angles along her sides. Her hair is styled in a straight fashion that goes across her forehead and covers her temple on one side, while the other side is tucked behind her ear. The rest of the hair blends down effortlessly with idle curls upon her ends. A large round curling iron should give you the uncomplicated effect achieved in this hairstyle and with the lazy curls to rest below your shoulders. Remember, to always begin from the bottom of your hair and work upward in small to medium sections, using your styling spray as you go. Jenna's make up is very light and natural and pleasant to look at, with her warm light shadow, tweezed brows, very light eyeliner, possible lashes and mascara, barely there blush and a light rosy coral lip color. She is a true picture of the girl next door.